High-performance semi-automatic wire feeders designed for numerous manufacturers welding power sources and powered by 24 volt AC for operator safety. Available in Standard and Euro-Style. Drive Roll Kits designed for Profax Pro II and PRO IV Standard and Euro-Style wire feeders. Drive Roll Kits and Replacement Parts are designed to accommodate wire sizes of .023" (0.58mm) to 1/16" (1.59mm). and wire styles V-Groove and V-Knurled. 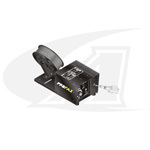 Drive Roll Assembly Replacement Parts are available for all Profax Pro Series wire feeders.